BOXING LEDGER | LATEST BOXING BLOGS | BOXING ARTICLES | BOXING BLOG FIGHT: Douglin To Face Carrasquillo February 18! Douglin To Face Carrasquillo February 18! 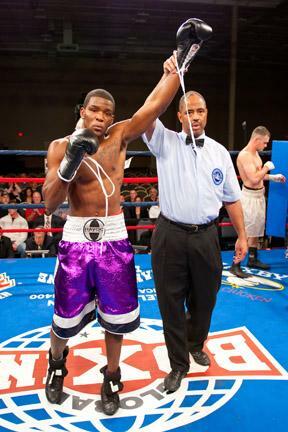 Morganville, NJ (February 3, 2011) – Unbeaten junior middleweight Denis “Da Mommas Boy” Douglin will look to take another step in the right direction when he battles cement fisted veteran Doel Carrasquillo Friday, February 18 at the Wicomico Civic Center in Salisbury, MD. Douglin, 12-0 (8 KO’s), is scheduled to fight in an eight rounder for the first time as a professional. The Morganville, NJ native stopped his last five opponents, most recently demolishing 11-2 Matt Berkshire in less than two minutes on December 17. Although his counterpart’s record of 14-17-1 with 12 KO’s doesn’t indicate frequent success, Carrasquillo is a proven spoiler that shattered dreams of notable fighters such as Isam Khalil, Wayland Willingham, Keenan Collins, The Contender’s Aaron Torres and Jorge Melendez. The Lancaster, PA based Puerto Rican is Douglin’s most experienced opponent to date, having also gone toe to toe wit the likes of 2000 Olympic Silver Medalist Ricardo Williams, highly touted Willie Nelson, Steve Chambers, unbeaten contender Mike Jones and Tim Coleman amongst others. The Douglin-Carrasquillo bout is part of the untelevised portion of an ESPN Friday Night Fights card promoted by Prize Fight Boxing in association with Global Boxing Promotions. Fans can reach Denis at twitter.com/damommasboy.